London is a cool city, there are no two ways about it. What other city in the world could rock red phone and post boxes, buses with two stories and policeman with strange long helmets. Where else do you find cab drivers that know 25,000 streets in their heads, lollipop ladies who stop cars with a stick and soldiers who stand as still as statues? It’s a city of startling contrasts. There’s tradition, of course, and seemingly no end to pomp and ceremony, especially when it comes to anything royal. But there’s also an electric modernity, it’s a buzzing metropolis which makes it an epicentre for business, the arts and of course, fashion. This all adds up to make London Fashion Week one of the most anticipated events in the fashion industry calendar. The official dates for the next events are 15 to 19 February, with some invitation-only events also taking place on the evening of 14 February. It’s a bi-annual trade show that happens in London every year in February and September. Alongside Paris, Milan and New York it is considered one of the ‘Grand Slam’ premium fashion events of the year. 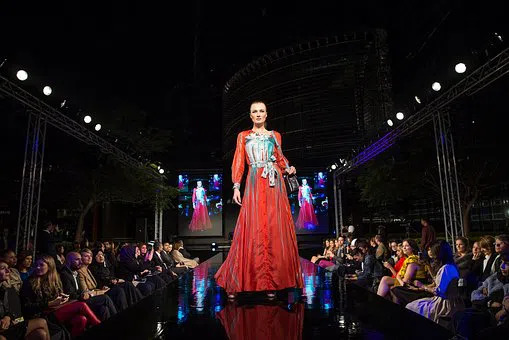 It is attended by approximately 5,000 people from retailers, fashion students and the influential fashion media as well as the 250 designers who are showing off their latest designs. The first version of it dates from 1983 and it is currently organised by the British Fashion Council (BFC). As it is an event that garners significant press attention, not to mention money, the BFC is also aided in the organisation by the Department for Business, Energy and Industrial Strategy (BEIS), formerly the Department for Business, Innovation and Skills (BIS). Although it generates a great deal of interest, it is not an event which is officially open to the general public. The four day London Fashion Week Festival (LFWF), which follows London Fashion Week, is instead targeted at everyday consumers. LFWF gives the general public the opportunity to see catwalk shows, go to talks and events hosted by industry leaders and get a heads up on what’s going to be ‘in’ for the next six months. There’s even an opportunity to buy outfits at cheaper prices exclusive to the show. The majority of events, shows and presentations will be held at the BFC Show Space, located at The Store X, 180 The Strand. As already mentioned, over 250 designers will be showcasing their talents and latest designs during the week. This is everyone from Adidas to Zilver, with brands such as Burberry, Jasper Conran, Julien Macdonald, Richard Malone, Victoria Beckham and Vivienne Westwood in between. Located at The Store X, the same location as the main Fashion Week events, the Designer Showrooms are where you can find 150 of the top designers who are attending the show. The aim of London Fashion Week and the London Fashion Week Festival is to raise the profile of brands in the industry. The showrooms are the most effective tool to do that. LFW is unique in the way that it is the only one of the four worldwide fashion events to have the Designer Showrooms in the same place as the event itself. The showrooms display fashion from all over the world, demonstrating LFW’s pull across the industry. This February you can expect to see designers from all over Europe; South Korea, China, Dubai and other Asian countries as well as Australia. The Designer Showrooms are where many worldwide brands owe their beginnings, due to the exposure it gives them to the most influential people in the business. This includes high profile fashion journalists and their publications who can make or break a label. It’s London, accommodation is available aplenty! There are hotels within walking distance as The Strand is a popular tourist destination stretching from Trafalgar Square to Temple Bar. February is also London’s coldest month, so tourism is at a slightly lower level, though it will still feel busy! If you’re there for the week, however, do you really want to be stuck in one room? What if you attend the London Fashion Week Festival and come out with some bargains? Where are you going to hang them all? Surely spacious serviced apartments in London make much more sense than a pokey hotel room? Thesqua.re has short stay apartments in London, available in Trafalgar Square and Covent Garden, both of which are just a short walk from the events in The Strand. At thesqua.re we pride ourselves on our service. When you're booking accommodation for your next business trip, our dedicated professionals make sure it is as simple as possible. You not just receive quality though you also gain insights from our online community and receive travel enhancing services all to help you get most of your travelling experience. Join a growing community of travelling professionals today.